United States’ President Trump and China’s President Xi Jinping met on the sidelines of the G20 Summit in Buenos Aires this past weekend to discuss their differences in trade. The outcome? A truce to the trade war and a pause on threatened tariff increases on January 1, 2019. For now, anyway. President Trump is going to take some time on this one to ensure there’s a real deal. If there isn’t a good deal on the table, he will proceed with the future tariffs in January, but for now, they have been postponed for 90 days. The tariffs in this scenario are those included in List 3 highlighted below: $200 billion worth of goods with a current 10% additional duty rate imposed on September 24, 2018, which will stay in effect. Let’s debrief the Section 301 situation. List 1, effective July 6, 2018 places an additional duty rate of 25% on $34 billion worth of goods from China. List 2, effective August 23, 2018 places an additional duty rate of 25% on $16 billion worth of goods from China. 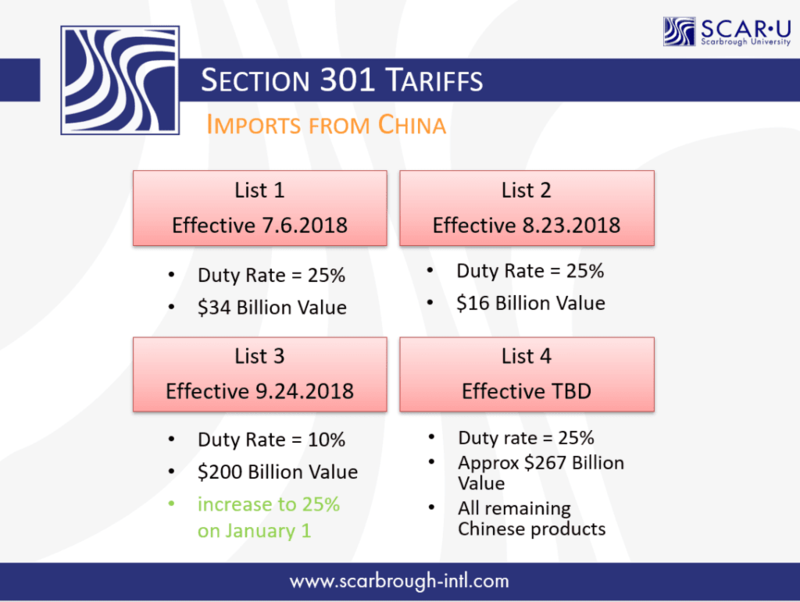 List 3, effective September 24, 2018 places an additional 10% on $200 billion worth of goods from China, but is slated to jump to 25% on January 1, 2019. It has been announced that a possible List 4 will take effect date-to-be-determined with an additional duty rate of 25% on $267 billion worth of goods from China. List 4 would encompass all other goods originating from China. The representatives have been given a 90-day deadline for trade talks. They hope to have something concrete by March 1, 2019. The Chinese has already agreed to resume buying agriculture and energy products from The United States, but has a long way to go. Some other comments that were mentioned include the fact that Chinese automakers have disclosed plans to enter the American market in 2020 and to reduce retaliatory tariffs on American cars exported into China, although no Chinese statement has backed up the comment about Chinese retaliatory tariffs.